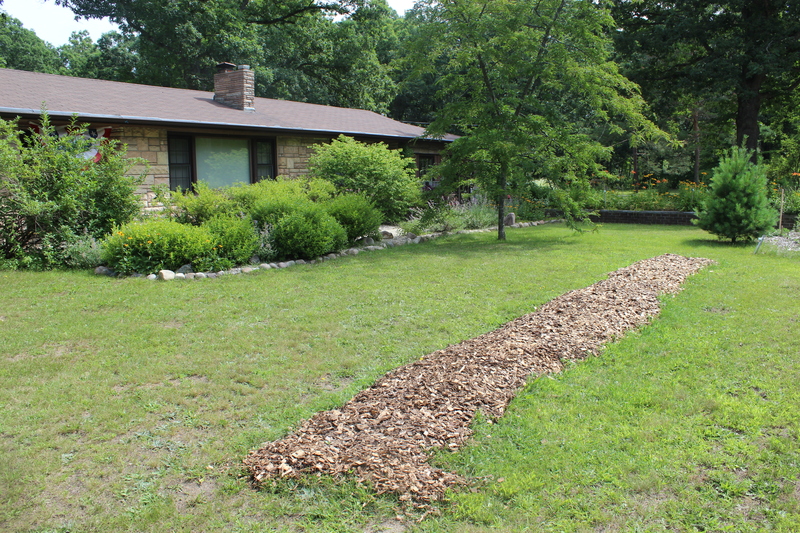 Putting down bark chips is an ongoing project for me on the Small House homestead. If only she could help shovel! Every Monday Gene and I drive the 20 miles into town for our restorative yoga class, lunch with our yoga friends and to buy our groceries. Since we hardly leave the homestead any other day this is as much of a social event as it is a physical one. Each time we go to town we also pick up a load of bark chips from a friend father’s blueberry field who has graciously blessed us with them for free. I typically spend one day the next week unloading, hauling and spreading those bark chips. 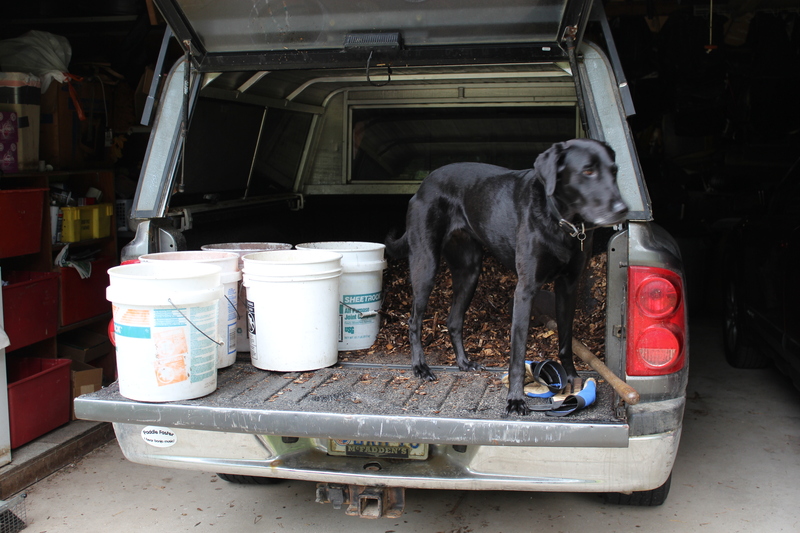 Today Gene worked on putting up the gutters on the pole barn for the two new rainwater containment totes, this was my bark chip spreading day. 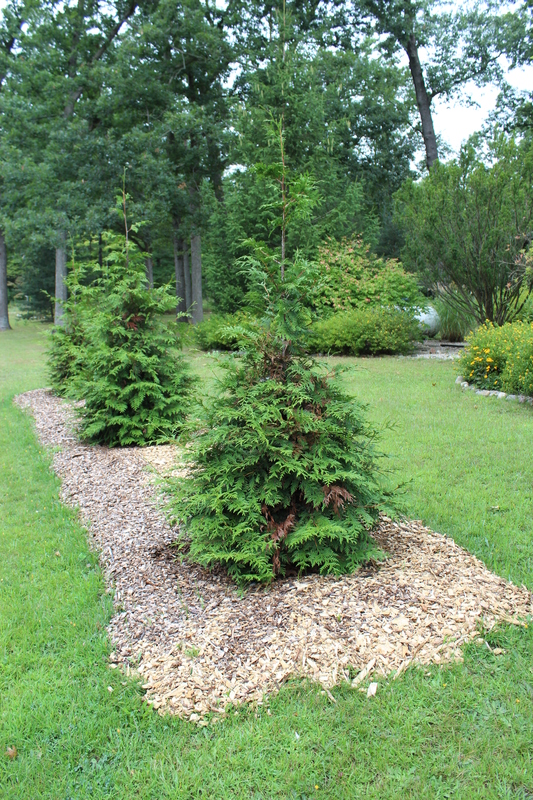 Bark chip bed around the arborvitae. This is a laborious project as I shovel them into a 5 gallon bucket, filled our cart Vermont and then haul them to where ever I am spreading them. Our beloved Labrador Sassy is my constant companion in this effort. 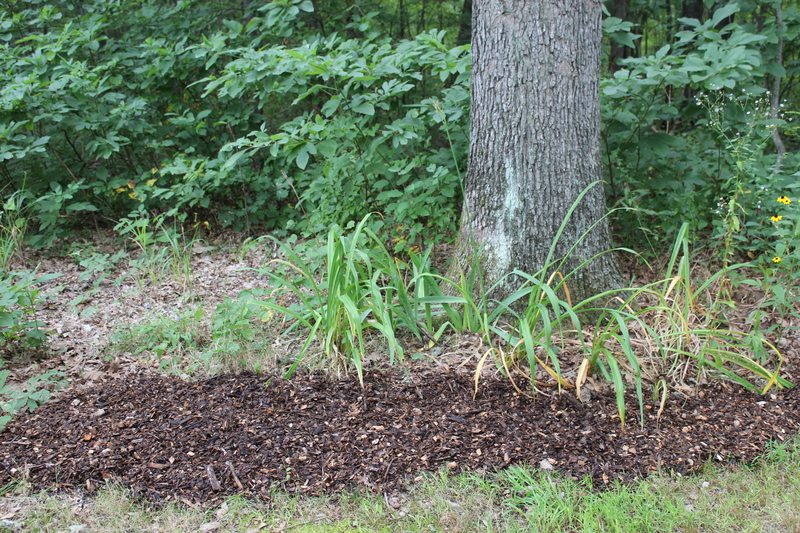 Edging the wooded garden with bark chips. Today I worked on edge of the garden bed behind Gene’s blacksmith forge. These chips will help to make things look tidier as well as build better soil. And with our sandy and very lean, oak Savannah forest dirt, better soil is something we can always use here. One of my top five favorite magazines. I entered our homestead garden in the 2015 Country Garden contest this year and although we have not been chosen, I decided to act as if we might be! So I have working hard all summer, weeding and spreading chips as mulch. If we are chosen, I have a head start and we are not, well things will be in great shape here anyway…I consider this a win/win no matter what happens. In case you are not familiar with this great quarterly magazine, About Country Gardens is an excellent resource for individuals who want to plant their own garden. Each issue is filled with planting diagrams, design ideas and beautiful photos. This insightful magazine helps every reader discover their green thumb. The call for country garden reads like this…..
Do you have a great country-style garden? Enter the Country Gardens Garden Awards contest for a chance to see your garden published. We want to see your photos and hear the story behind your inspirational garden or garden room. Only amateur gardeners are eligible for awards; participants cannot earn their living from gardening, landscaping, or interior design. Gardens that have received other national gardening honors or awards, or have been featured in a national magazine, are ineligible. Please retain an original copy of your complete entry for your records; materials will not be returned. Images from entries may be shared online. Submissions must be received by September 30, 2014. 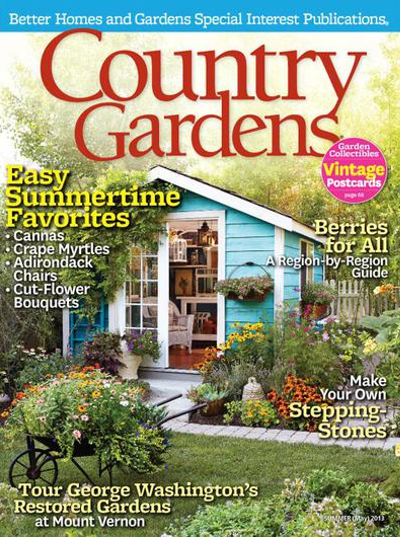 Award winners will be selected by Country Gardens editors to be featured in a future issue. Send us your name, address, and telephone number, as well as color photographs or color printouts of digital photos of your garden, a rough landscape plan, and a brief description of your garden or garden room. 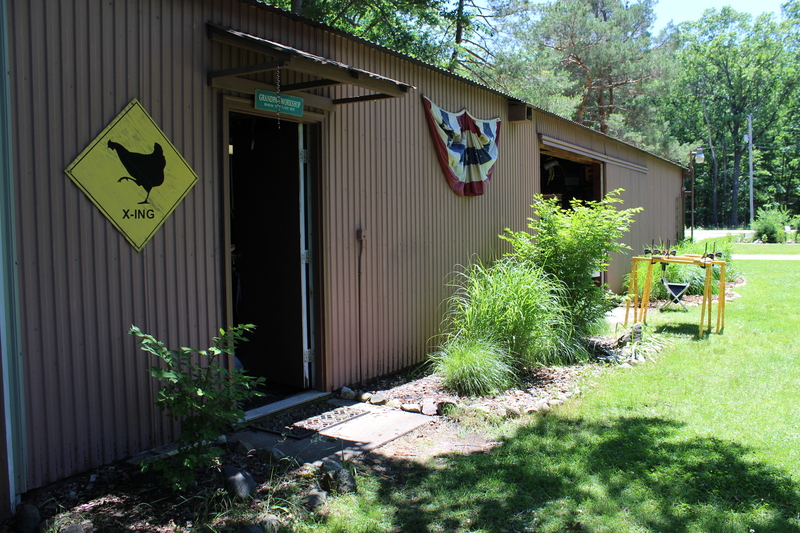 Now I know better not to count my chickens until they hatch, however with our rural five acre spread and approximately 2 ½ acres in gardens, two hand-built chicken coops and runs, my hand papermaking studio and Gene’s vintage blacksmith shop I thought we might just be a viable candidate for the “Best County Garden” category. Maybe they will even start a new category called Best Homestead Garden! My theory has always been… if you don’t ask, you don’t get! Wish us luck! Today dawned sunny and cool and without the awful humidity of the past two weeks. What a blessing! I opened up the windows and turned on the window fan. It was lovely to have fresh air soaring through the homestead today. We had a heavy rainstorm move thru our area last night dumping another 4.5” of rain on us. Our water containment totes are full to the brim for the second time this season, which is good, but my poor potted plants that decorate the front of my home and hide the ugly air conditioner are rotting. I pour out any standing water but I am still not successful in drying them out enough to really matter. Sigh. They were so pretty and doing so well. It is a lovely day here in the homestead; breezy, sunny and warm with low humidity. A perfect early summer day. Loaded and put down one truck load of bark chips. Weeded flower beds at the pole barn and added bark chip mulch to those beds. Picked-up and shoveled a truck load of well composted horse manure soil. 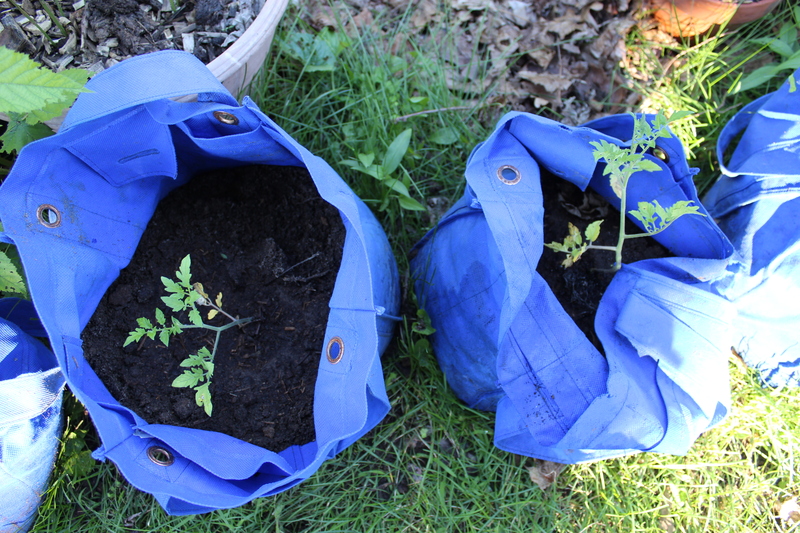 I filled 15 grow bags and pots with soil and planted 15 heritage tomatoes. I have more tomatoes to plant but I am out of containers and ground. 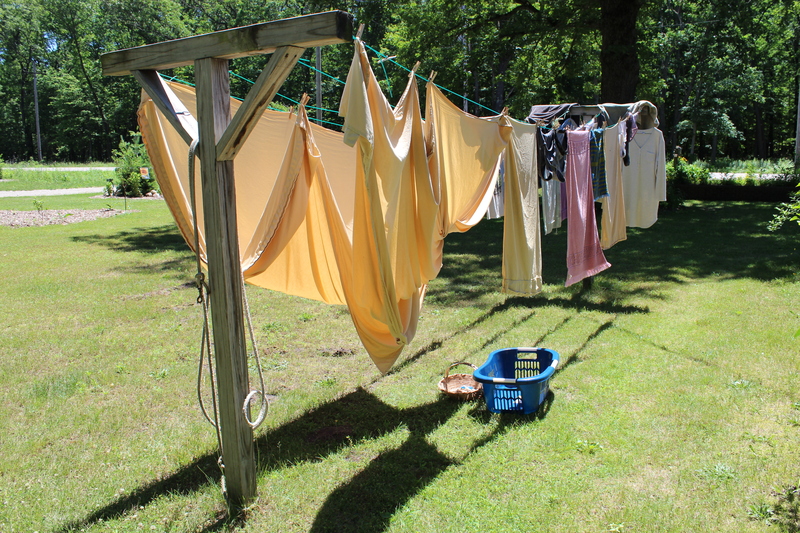 I did a large load of wash (including our water-bed sheets) and hung them on the line. By afternoon they were folded and put away. I washed a load of dishes and by afternoon emptied the dishwasher and put them away. 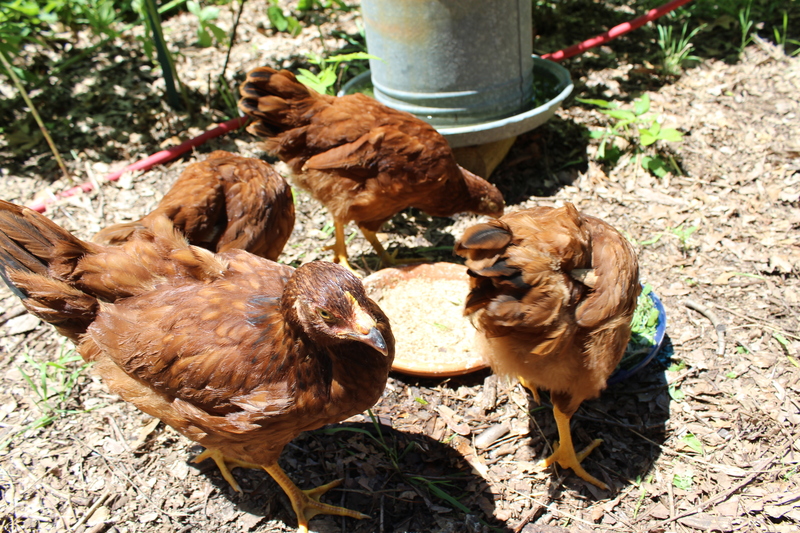 I started searching for organic chicken feed that is not mash as the chickens seem to prefer pecking the seeds and so much mash is wasted. I also did some Internet research on Curcumin, recommended to us by an acupuncturist friend. 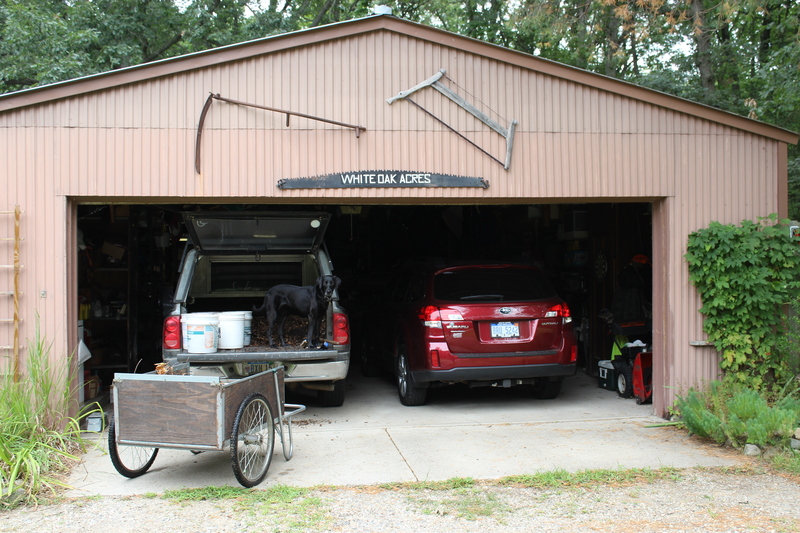 Gene worked on the chicken coop extension completing the two sets of double doors, ran Sassy and helped me when asked. 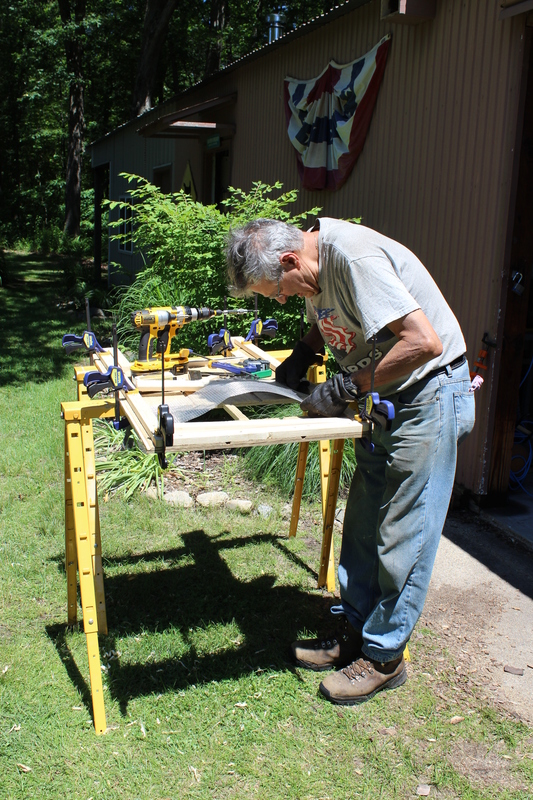 Lots of projects getting done on the homestead this month as I know that the heat and humidity of July is coming, as well as my granddaughter!! There is no one Arbor Day on our Homestead. We plant trees both spring and fall here. 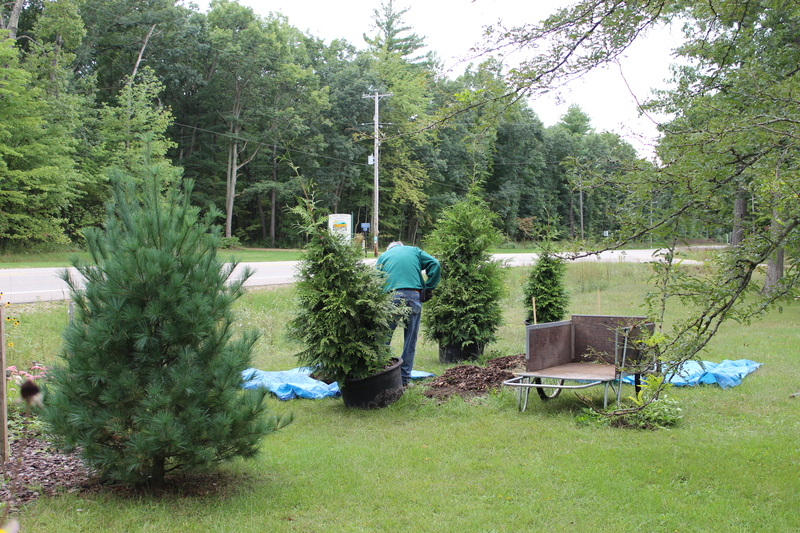 This fall we planted five more 6 foot tall trees on our Small House property. 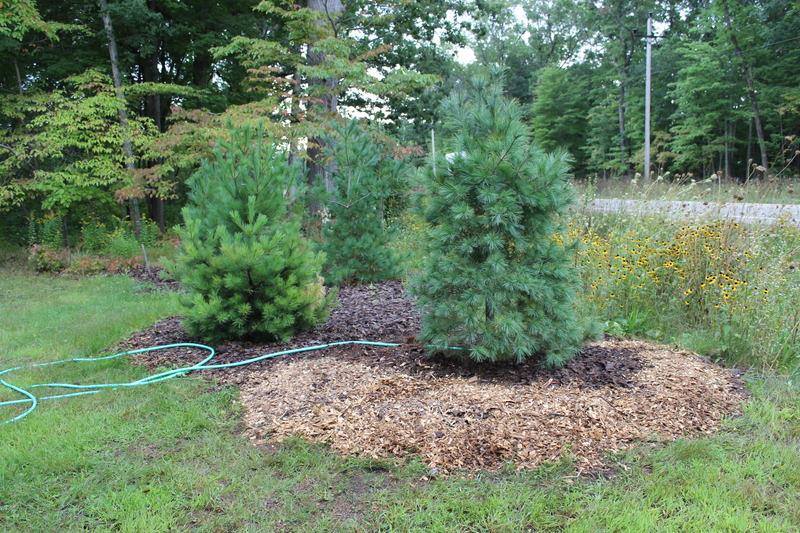 Two are White Pines and three are Arborvitae. It seems like we are always planting one kind of tree or another. Mostly we plant them for screening from the busy roadway outside of our home but trees, as you know, give us so many more other benefits too. 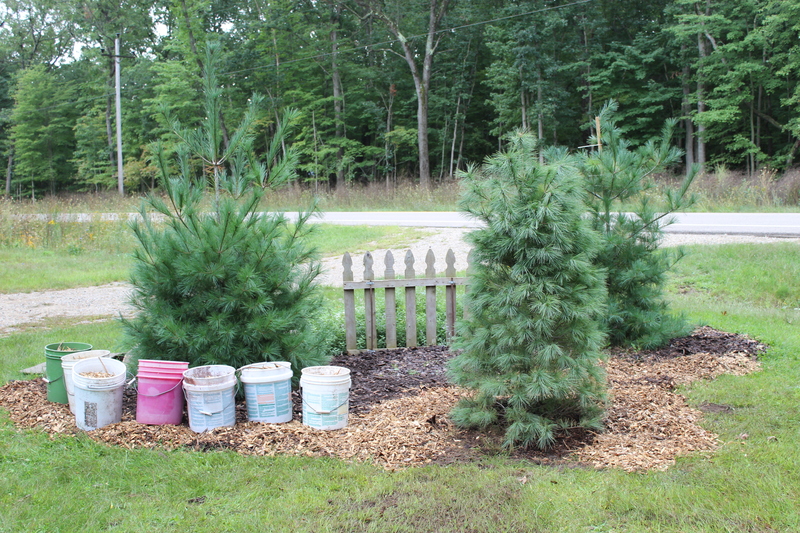 These White Pines will help to screen noise, traffic and pollution from the roadway to our home. It takes a White Pine approximately 75 years to grow to its mature height (75 ft.) and width (35-50 ft.). Because we have lean, sandy, oak savanna forest soil here we work hard to amend our soil before we plant, sometimes as much as two years in advance. We typically add a lot of compost to the soil mix, either my own homemade compost or well-rotted horse manure compost we haul home from a friends horse farm. We top dress each tree with several inches of bark chips on top after it is planted and watered in. This is the strip of bark chips we readied over two years ago to help our soil along, pre-planting. The row of arborvitae will help to screen the front of our home from the traffic on this two lane roadway. I know that we won’t live to see these trees mature in our lifetime but this is one of the things we do on our homestead because we know in our hearts this action is the right thing to do. This is green living and right-action on behalf of our community. 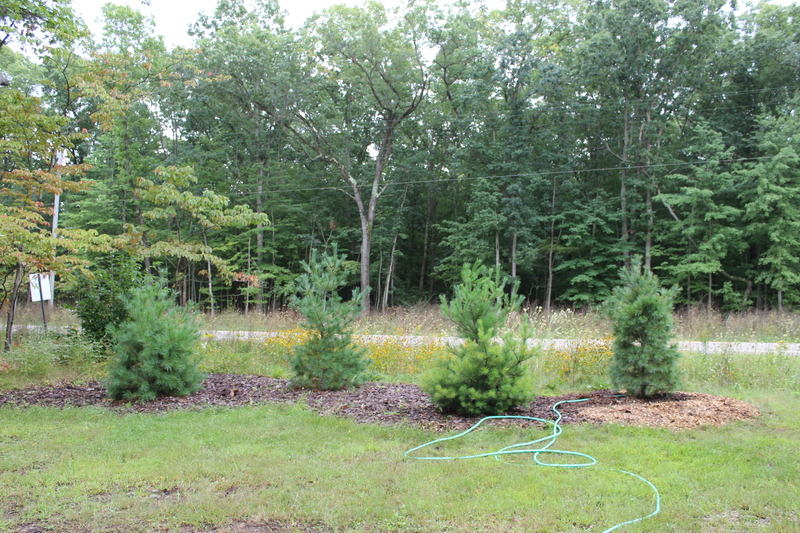 Eventually these White Pines will grow to create a living screen. This planting bed sits alongside of our gravel driveway and provides a barrier between out roadway and our home. We plant trees for Mother Nature and the good of our earth community. Excuse me while I go out and water my new trees! Blessings from The Small House Homestead.